Campaigners say Google are encouraging the poaching of elephants by running advertisements promoting ivory products. 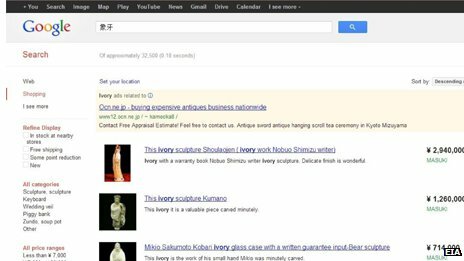 The Environmental Investigation Agency (EIA) says more than 10,000 ads about ivory were running on Google's Japanese shopping site. They have written to the internet giant asking for their removal. In response, Google said adverts relating to endangered species were not allowed on their sites. The claim was made at the meeting of the Convention on the International Trade in Endangered Species (Cites) taking place in Bangkok. EIA says that they have been monitoring advertising in Japan for a long time, looking for evidence of whale products being promoted for sale. They found more than 1,400 of these types of ads. But when they carried out a similar search for ivory ads on Google's wholly owned Japanese shopping site, they found more than 10,000. The vast majority, more than 80% were for “hanko”, a Japanese name seal that people use to sign official documents. The stamps are often inlaid with ivory lettering. The campaigners say the ads are contrary to Google’s own policies which don’t allow the promotion of elephant or whale products. 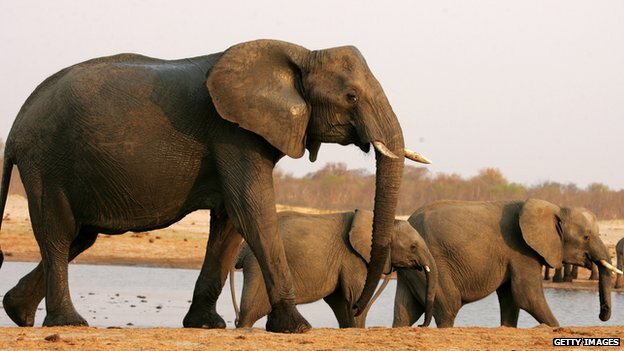 And the EIA says they are contributing to elephant poaching across Africa. Google acknowledged that these type of ads violated their own terms. In a statement they said: "Ads for products obtained from endangered or threatened species are not allowed on Google. As soon as we detect ads that violate our advertising policies, we remove them." EIA says that they wrote to Google on 22 February to inform them of the problem but they have received no response as yet. They say that the adverts are still up and running. “I don’t know what’s going on in Google,” said Allan Thornton. “They are considered a progressive company who are interested in environmental issues, but they seem to have made some pretty serious mistakes by letting whale and ivory products be sold on their Google Japan site,” he added. Dealing with the ivory issues is one of the key tasks for this meeting of Cites in Bangkok. The sale of elephant tusks was banned back in 1989. But elephant welfare groups say around 30,000 elephants a year are still being killed to meet the demand for trinkets and carvings that are often sold to tourists in countries like Thailand. The internet has given a huge boost to the ivory business. Last year, another investigation by the International Fund for Animal Welfare (IFAW) found over 17,000 ivory products on sale on Chinese websites.